The discovery of a 10€ return bus ticket from Salamanca to Bilbao last weekend, turned into a fantastic first visit to the Basque Country! Quite honestly, I wish we could have just extended our trip and stayed the whole week exploring the region as it was that good! 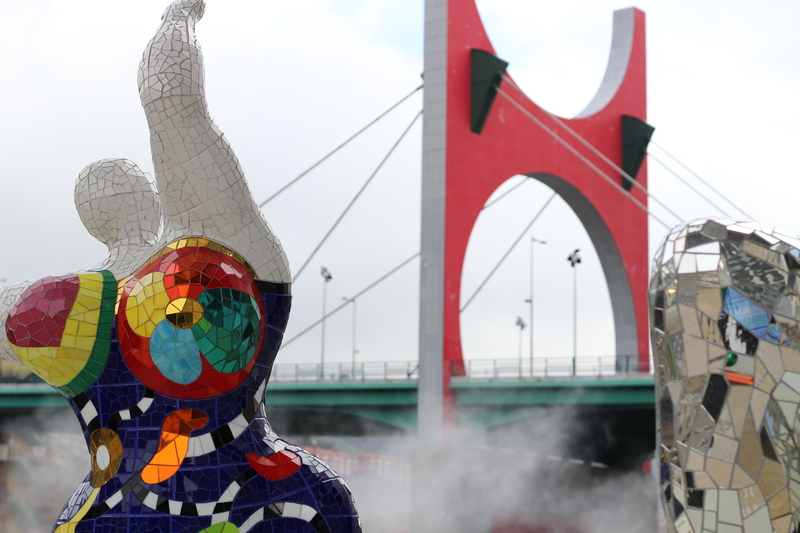 From all the things I have heard about Bilbao and the Basque country in general, is that it is pretty rainy, but for the two days we were there, we were blessed with good weather. Bilbao is known to be quite ‘industrial’ and after hearing mixed reviews of people who have been there already, I wasn’t really sure whether it would be for me. 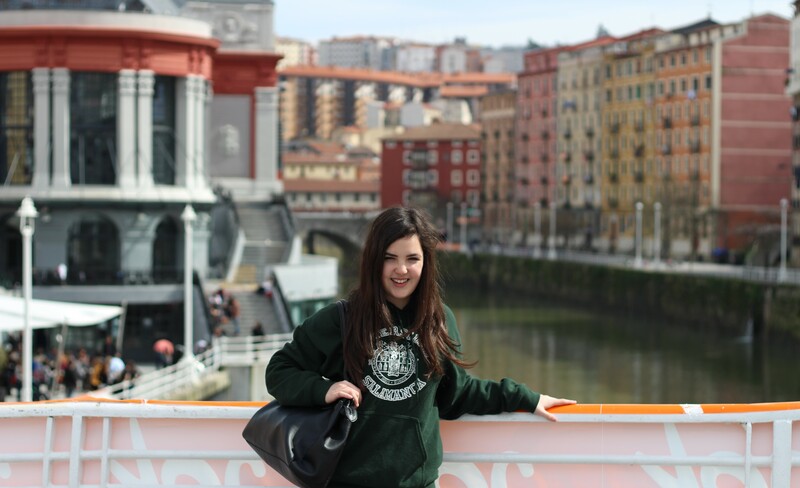 I’m so glad to have given Bilbao a chance, as I loved it and hope to return in the future. When I imagined Bilbao, I thought of modern buildings, industrial structures etc. 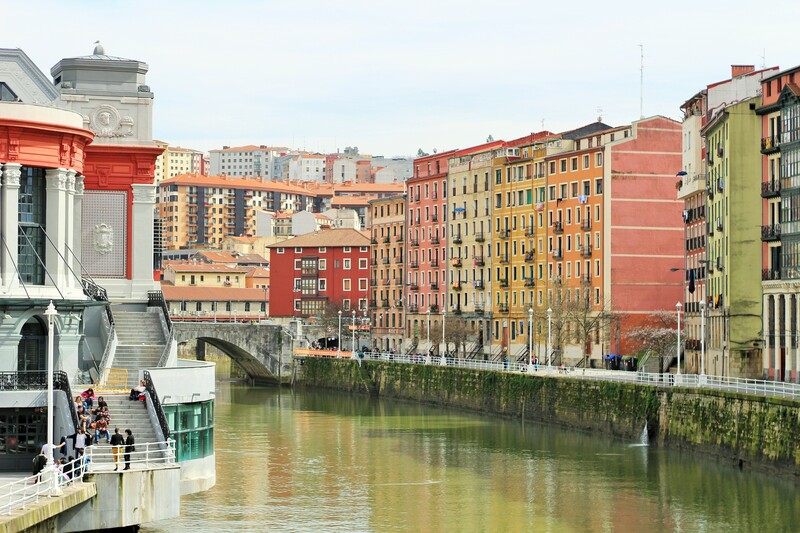 not a lot of beauty, but in fact, Bilbao has a mix of the old and the new, and it works. It has a very lively Old Town with small cobbled streets which you can get lost in with many pintxos bars and shops with people pouring out into the streets day and night. In only a 20-minute walk, you are at the Guggenheim Museum, the building being an example of modern art in its own right. We stayed in an AirBnB apartment in the heart of the Casco viejo, and I’d recommend staying in this area because that’s where everything is going on. After arriving late on Friday night, we indulged in the 100 Montaditos which was just a few doors down from our flat, a bit too tired to venture further experimenting with the local food. An early start on Saturday morning involved a leisurely walk through the city, along the river towards the Guggenheim Museum. We spent a good few hours walking around the museum. Student entry is 6.50€ which is quite reasonable as you can spend quite a while in here and it also includes an audio guide which was useful. First things first though, we needed some breakfast as we didn’t have access to the kitchen in our AirBnB. The Guggenheim Museum has a café and a Bistro restaurant. The Bistro looks good for lunch and dinner, albeit a bit on the expensive side, but the café was reasonably priced for breakfast and just what we needed. The highlights in the museum for me were: Humans by Christian Boltanski which reminded me of some of the exhibits in Yad Vashem, Jerusalem and ‘The Matter of Time’ by Richard Serra, where you can walk around the exhibit and the shapes of the walls you walk through make you experience time differently (slow, fast etc.). There was also a temporary exhibit of Nikki Saint Phalle, which centered around Shooting Paintings, Nanas and films. It is quite a rebellious exhibit, educational but also slightly very unnerving at times. Interesting but not my favourite. After a trip to La Tagliatella to refuel and a look at the new, fancy Football Stadium, we made our way to the second museum of the day, Museo de Bellas Artes de Bilbao (Fine Arts Museum). I had high hopes for this museum, especially as it is highly rated on TripAdvisor, and the lady at the Tourist Information Office said we couldn’t miss it, but I was seriously disappointed. The museum seems to be lacking identity, with many different types of art in the same rooms. There is currently an exhibit of 1950s French Fashion, but instead of an exhibit solely focusing on this purpose, there are many fantastic designer dresses put in the rooms of other exhibits, such as Medieval Art amongst other things. This didn’t really work for me as they just looked like they were there as they had no other space for them, and there wasn’t much information about the history of French fashion during that era, except a few paragraphs in the first room talking about the fall in designer houses, the death of Christian Dior and the rise of YSL. The museum however is in a beautiful building and the park outside is worth a walk around as well, but the art itself wasn’t for me. 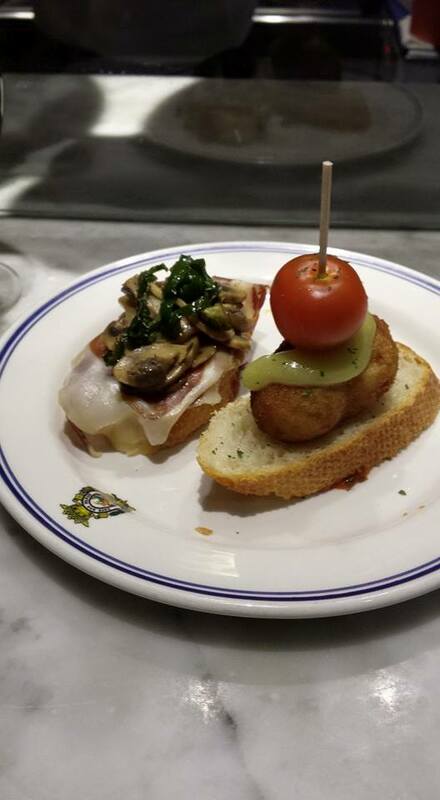 That evening, we decided to make our way to the Plaza Nueva in the casco viejo, as that is where there is a large concentration of pintxos bars. 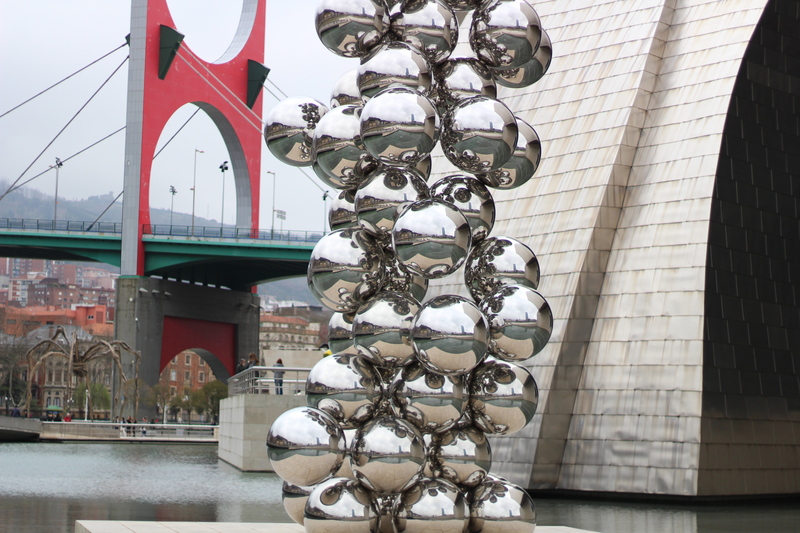 This turned into our favourite activity in Bilbao and we returned the following evening! It’s probably a good thing I don’t live in the Basque country, because I would just eat the beautiful pintxos every day! 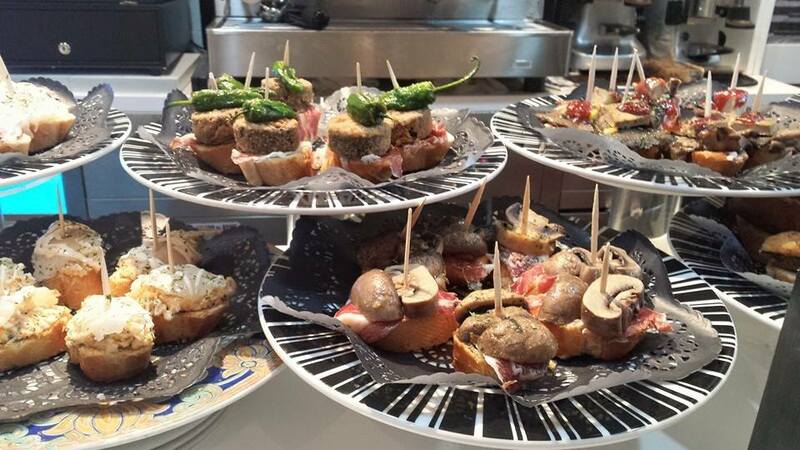 If you visit Bilbao, you have to go pintxos bar crawling! Start at ‘Bar Charly’ and then mak your way along! The pintxos are essentially ‘tapas’ dishes, but they are like an art form: well presented, delicious and reasonably priced. 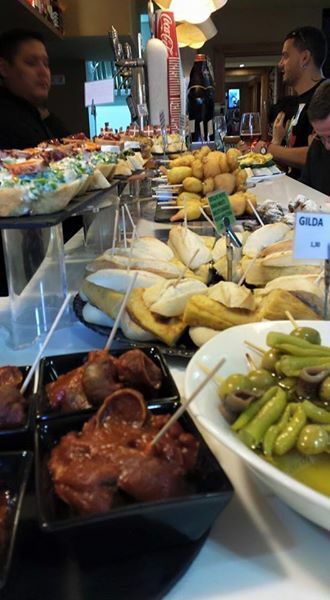 Each bar has a selection of pintxos, and you just sit at the bar, point at one that takes your fancy and enjoy. When you’re ready, it’s time to move on to the next pintxos bar where more beautiful dishes await you, and then you go to the next bar and the next one, and the next one, until you can’t eat any more! During my visit, I tried: battered cod, frogs legs, chicken tikka, tortilla, duck dumplings, all of these are served on a piece of bread and heated up in a microwave for a few seconds so they are nice and warm for you. 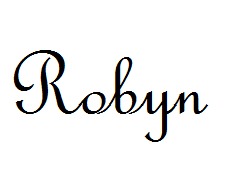 It was divine. There were also many other seafood and pork pintxos that James tried and enjoyed. On the Sunday morning (Palm Sunday), we wandered around the casco viejo. it happened there was some kind of Basque festival also on that day, there were parades in the street with music and people dancing, and near the river, there were pop-up stages with bands playing, and tents with drinks and Basque cuisine on offer with a large crowd. We didn’t really know what this was all about, as I found nothing online about it, the Tourist Office hadn’t mentioned anything and all the posters and leaflets about it were all in Basque (not helpful). After a walk around, we went for lunch at El Txoko Berria. We had walked past here a few times and had agreed the price range and menu was fine for us both (I’m quite difficult as I don’t eat certain foods!). It was still rather early for Spanish standards, about 1:30pm and the restaurant was rather empty still. The waiter led us upstairs to a table in the window, which gave us a fantastic view of the street for people watching, and seeing some of the parades come past! Although it was a Basque restaurant, they spoke Spanish to me and we had a fantastic three-course meal with drinks for what felt like a very good price (20€ each).. 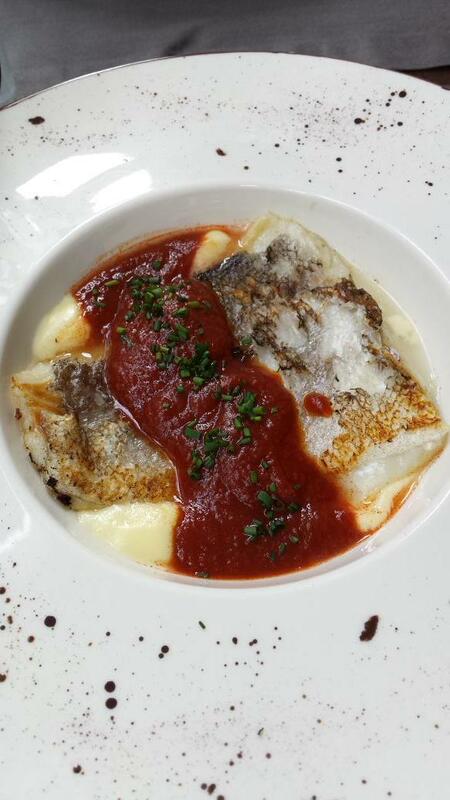 So yes, the food in Bilbao was excellent. The only non-food related tourist activity we did on the Sunday was take the Artxanda Funicular for 95 cents each way, up the hill to reach fantastic views of Bilbao from above. It was lovely and sunny, so it was a nice break to lie on the grass and watch the crowded streets of Bilbao from above, where we could still hear the music from the festival far away. 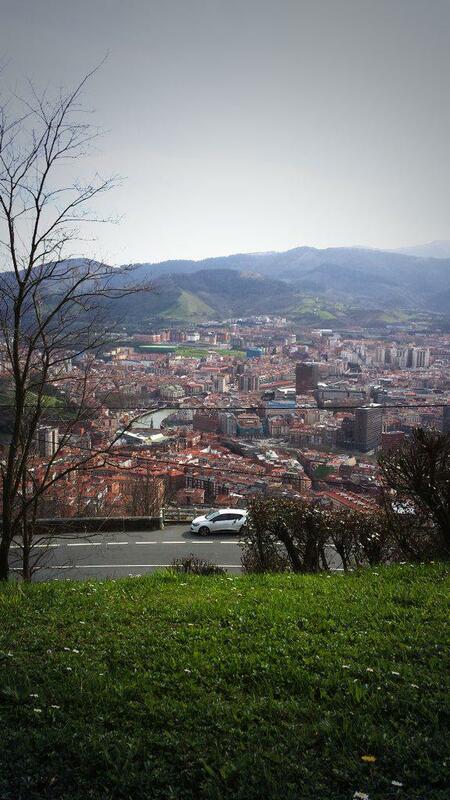 Although Bilbao is a big city, you can always see greenary around you as it is surrounded by mountains, so you never feel far away from nature. 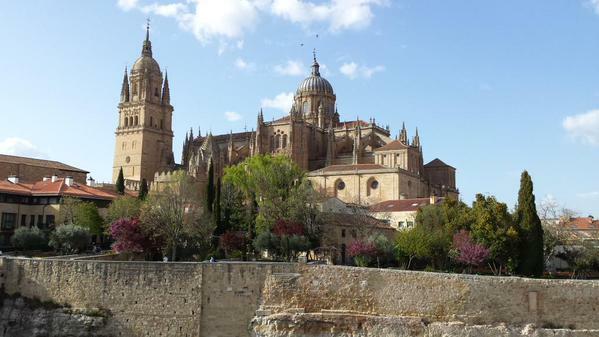 We caught our return coach to Salamanca at 8am on the Monday, which was especially difficult as the clocks went forward that weekend! We were back in time to watch that evenings procession for Semana Santa that I had been wanting to see especially. We had such a fantastic time in Bilbao, and hopefully I will be able to see more of the Basque country again sometime soon! I am currently at home in the UK for Easter Weekend, and it’s so lovely to be back to home comforts and my cat’s cuddles. 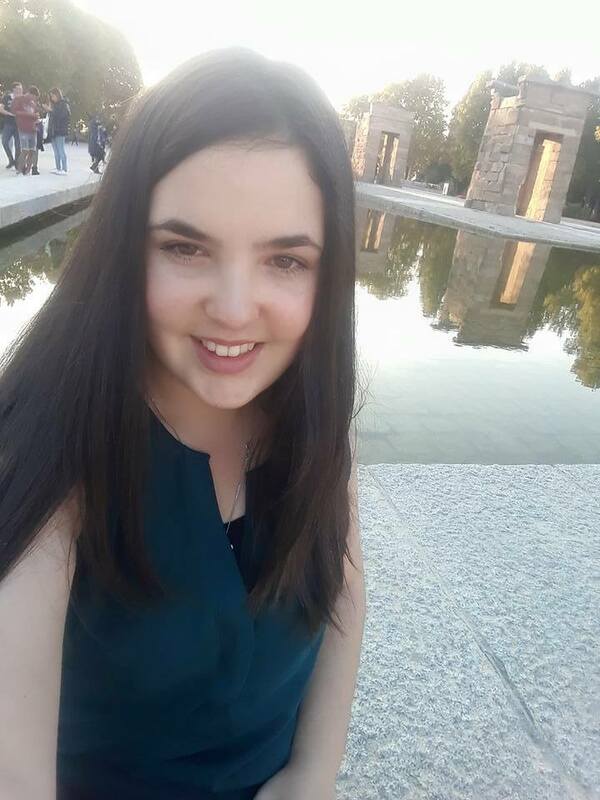 I would have liked to have spent more time at home, but i didn’t want to miss out on some of the festivities of Semana Santa in Salamanca beforehand, which I will write about in the next post. View from the roof terrace of my piso! I have only lived there a few days so far, but I think I will be happier in this place. I’m still living with Spanish people which will be ‘good for language practice’, and it is slightly cheaper as well with plenty of sunlight! I only have 9 weeks left in Salamanca, and I wanted to make the most of it, but if this place doesn’t work out, it is still just 9 weeks.